The Grand Mirage Resort is a refined, refreshingly comfortable low-rise resort standing in lush tropical gardens on one of the finest beaches in Bali, Nusa Dua. The Grand Mirage Resort's 310 rooms, inclusive of 24 suites and 2 family bungalows, are the perfect place to relax after a fun filled day. Glowing wooden floors and panels, complemented by the warm blues and greens of the furnishings, create a cocooned environment. Elegantly appointed with traditional Balinese decor, the Grand Mirage Resort's rooms offer private balconies affording spectacular view of the Indian Ocean or manicured gardens and lagoons. 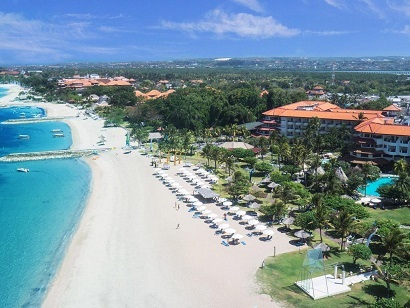 Discovery Kartika Plaza Hotel Right on the beachfront of the popular South Kuta, the Discovery Kartika Plaza Hotel Bali offers a mix of 318 Ocean-Facing Rooms and Family Suites, set amidst an oasis of 8 acres of tropical gardens and shady coconut palms. Discovery Kartika Plaza Hotel Bali a wide choice of restaurants and excellent sporting facilities, and is ideally situated within walking distance to all main shops, restaurants, entertainment venues, and is conveniently positioned for international conferences. 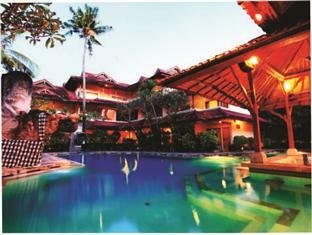 Ramayana Resort & Spa To discover most of Bali with ease, guests can use Ramayana Resort & Spa as their home base. This 4-star accommodation provides 212 beautifully furnished guestrooms and attentive service. All guestrooms are conveniently equipped with separate shower, room safe, balcony deck, writing desk and coffee/tea. To suit all guests' convenience, this elegant hotel in Bali features laundry service, restaurant, room service, multi-lingual staff and bar. Guests can make the most of their stay at the hotel by unwinding at an array of recreational facilities, including Jacuzzi, sauna, spa, massage and swimming pool. With top-class business facilities, including conference rooms, business center and high speed Internet access, this hotel is the perfect choice for business travelers. With an extensive list of facilities coupled with good services, this is one of the most recommended accommodations in Bali. Bali Dynasty Resort Tucked away in tropically landscaped gardens in the peaceful village of Tuban, Bali Dynasty Resort combines international standards with contemporary Balinese architecture. The Dynasty Resort, Bali has beautifully manicured gardens and is within a short stroll from the excitement of Kuta and within easy reach of the international airport. Dining options at the the Bali Dynasty Resort include over five restaurants and five bars. 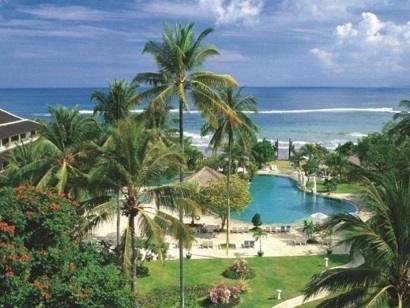 The Bali Dynasty Resort offers 312 guest rooms in a wide range of types to suit all needs. 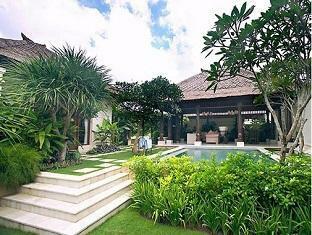 Patmase villas at Jimbaran has easy access to many of Bali's tourist attractions. 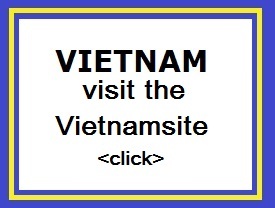 The accommodation offers 17 tastefully-decorated rooms furnished with modern amenities. Guestroom appointments consist of turndown service, CD player, mini bar, climate control, coffee/tea and writing desk. All guests staying at this superb Bali hotel can enjoy all the modern facilities offered by the hotel such as coffee shop, laundry service, butler service, restaurant, babysitting, room service and multi-lingual staff. Guests can make the most of their stay at the hotel by unwinding at an array of recreational facilities, including massage, spa and swimming pool. Every guest will have a memorable stay with the hotel's stylish facilities and great service. The Legian Paradiso is centrally located within walking distance of the island's best shop, bars, restaurants and beaches, and is just a few minutes from Ngurah Rai International Airport. With superb conference and function facilities that can accommodate up to 50 people, the Legian Paradiso Hotel offers an ideal venue for small-scale business and social gatherings. Bar and dining options at the Legian Paradiso Hotel are catered for by three restaurants, a coffee house, a lobby lounge area, and two bars, which also provide a range of entertainment. Room service at the Legian Paradiso Hotel is available twenty-four hours a day. 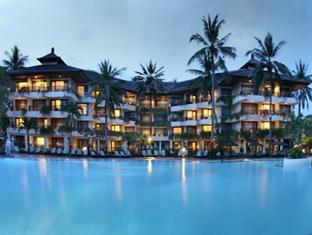 The 124 well-appointed guest rooms at the Legian Paradiso Hotel offer a range of amenities to ensure a relaxing stay. Recreational facilities at the Legian Paradiso Hotel include a swimming pool set in two hectares of lush tropical gardens, a swim-up bar, landscaped gardens offering a quiet sun-bathing and relaxation, and a pool table. 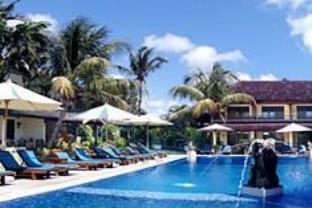 Scuba diving and surfing trips can also be arranged by staff at the Legian Paradiso Hotel. Local area attractions within easy reach of the Legian Paradiso Hotel include the towns of Denpasar, Sanur, and Nusa Dua, and the artistic center of Ubud. 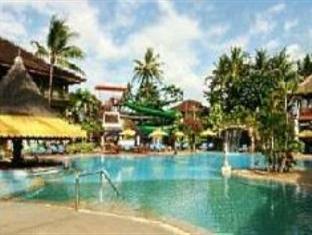 Bounty Hotel boasting a superb tropical garden location travelers will discover the Bounty Hotel Bali situated only 15 minutes from Bali International Airport and within a few minutes walk to Kuta Beach and many key attractions. The Bounty Hotel Bali Hotel is a property of distinction featuring an inspirational restaurant and sociable bar where guests will experience fine cuisine to suit any social occasion. The Bounty Hotel offers a 166 finely decorated spacious guestrooms equipped with modern amenities to ensure a pleasurable stay. 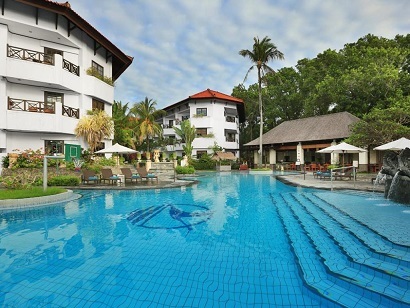 Guests to the Bounty Hotel will also be able to relax and unwind in 2 captivating swimming pools. Pelangi Bali Hotel Spa has easy access to many of Bali's tourist attractions. The hotel offers 89 well-furnished guestrooms, all equipped with modern amenities to ensure guests' satisfaction. Individual guestrooms are fully appointed with balcony deck, television, telephone (idd), air conditioning and mini bar. To suit all guests' convenience, this elegant hotel in Bali features airport transfer, laundry service, restaurant and safe deposit box. The hotel's guests can also unwind with a variety of recreational activities such as sauna, swimming pool, spa and fitness room. Every guest will have a memorable stay with the hotel's stylish facilities and great service. Club Bali Mirage was the first all-inclusive resort in Indonesia, and it is built in a modern architectural design with Balinese touches. Nestled amidst 3.5 acres of landscaped gardens and on the sandy beach of Tanjung Benoa, Nusa Dua, the resort is about 25 minutes from the airport.Club Bali Mirage offers a total of 98 spacious rooms over 3 floors, comprising 66 Deluxe Rooms, 20 Romantic Rooms and 12 suites. All rooms are comfortably furnished and feature marble bathrooms with bathtubs, balcony or terrace. Each room is equipped with individually controlled air-conditioning, satellite TV with movie channel, refrigerator, hairdryer, IDD telephone and safety deposit box. All rooms have a sofa bed, which can accommodate a third person comfortably.The Kemuning Restaurant serves breakfast and certain buffet dinners, whilst the Kamboja Pool Side. 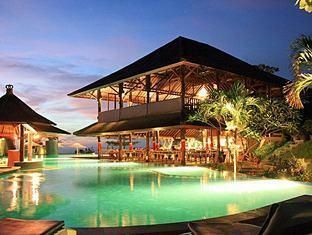 Sanur Beach Hotel is the ideal point to set off for your sightseeing excursions. Hotel Sanur Beach is just ten minutes away from Ngurah Rai International Airport and right in the middle of all Sanurs attractions. There are 425 guestrooms and suites, all with balconies. There are several conference rooms at Hotel Sanur Beach to suit all sizes of functions. Leisure facilities at Hotel Sanur Beach include two large free-form swimming pools, two children's pools, children's playground, two tennis courts, badminton court and fitness centre with sauna, whirlpool and massage. Water sports are also available at Hotel Sanur Beach.